It looks like Laurie J. Marks might turn out be another. 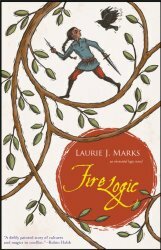 Laurie is best known for her Elemental Logic series (originally from Tor Books). The first two volumes are out of print… But now all three books have been released as ebooks by her current publisher, Small Beer Press. Well, I won’t gloat too much. But it helps to know the author. I especially like the design of Laurie’s magical system, and how it operates through the citizens of the land of Shaftal. You can (sometimes) work magic. But more often magic is working you — and not at your convenience. The land has its own plans and needs. Fortunately, I have a copy, and I’ve put it here for you to read in its original oddly stilted and slightly turgid entirety. Well, I wrote it ages ago, as I said.. but I still stand by it! Laurie’s other books are also hard to find, and out of print — but she has plans to put them up as ebooks, too. So, you might soon have a lot of Laurie J. Marks books to add to your ebook library.